Be it the videos where he makes attempt after attempt to create the perfect slime or the one of him having breakfast, one understands nothing. But the emotions make their way straight to our hearts. Kindness is the most underrated quality in the world. We often hear from people that it is the key to life. But does kindness pay off? For this 73-year-old Portuguese YouTuber, it did in the most unexpected way possible. Little did Nilson Izaias Papinho know that his channel would hit 3.8 million subscriptions in just a week. All for one kind act! You may ask what's special about thanking subscribers as it is a normal YouTube norm. But would you have ever thought of writing down the names of the subscribers and thanking them in a video? 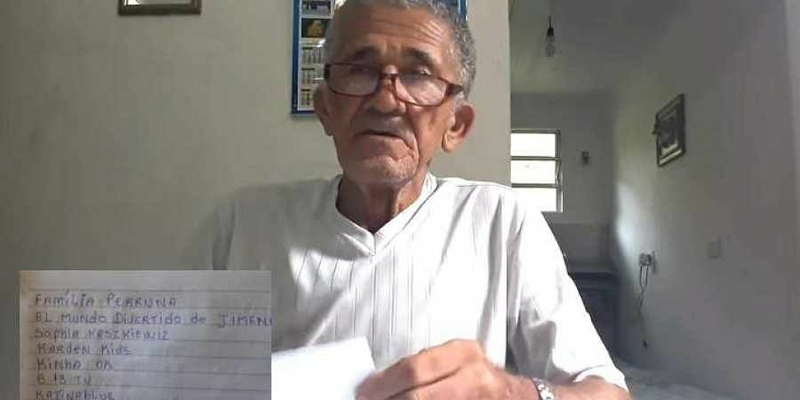 Nilson's touching gesture has turned him into a YouTube sensation. Nilson is not new to YouTube though. He's been posting videos since last February. His channel has 32 videos documenting his everyday life. And they are so natural that one can't help but smile watching them. All his videos are in Portuguese but his kindness has broken the language barrier. Be it the videos where he makes attempt after attempt to create the perfect slime or the one of him having breakfast, one understands nothing. But the emotions make their way straight to our hearts. With his YouTube videos racking up views ranging from 100k to 8.6M, we wonder if Nilson would've ever imagined he'd get such overflowing love from people. He recently made his debut on Twitter too and has over 95K followers. Now we know the coolest granddad on the internet. He even knows how to make money easily. Check it out here! Nilson also teaches us one more valuable lesson -- appreciating the little things in life. He sure knows how to keep himself happy in his own simple yet beautiful ways.